Man! 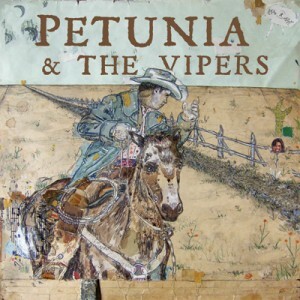 I had the best time at the Petunia and the Vipers show Thursday night! What a great band. I was about to say original. Channelling Wilf Carter and Hank Williams Sr. may not be original, but it’s friggin’ awesome. I first heard them a couple of months ago on cbcmusic.ca on the Alternative Country channel and needed to see them live. I was super lucky to find out they were going to play Lydia’s within a few weeks. I found the video for Yes Baby Yes (Cold Heartbreaker) on YouTube and loved it! And last night they sang a 100-year-old song (Ragtime Cowboy Joe) that I think I’m going to try writing a short story about. Petunia has this great kazoo that’s attached by electrical tape to what seems to be the end of a bicycle horn, which acts like a trumpet bell. You’ll hear it at the beginning of Yes Baby Yes, after the yodelling—amazing. 9 out of 10 saltines. These guys are a lot of fun. And the main guy’s name’s Petunia. Weird… and cool.